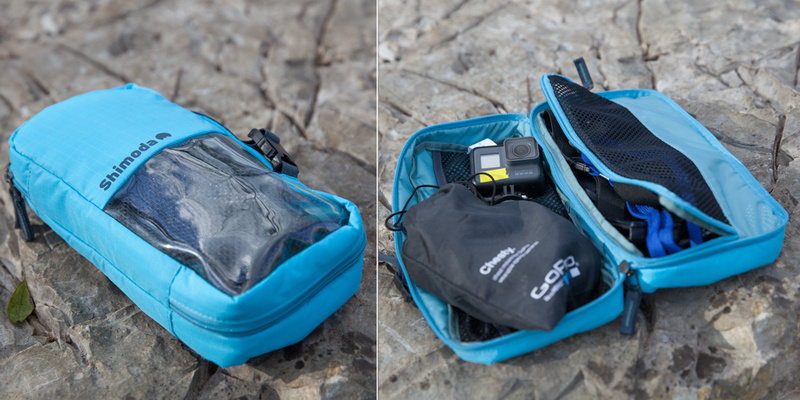 I’d like to introduce you to the Shimoda Adventure Camera bags, specifically, the Explore 60. 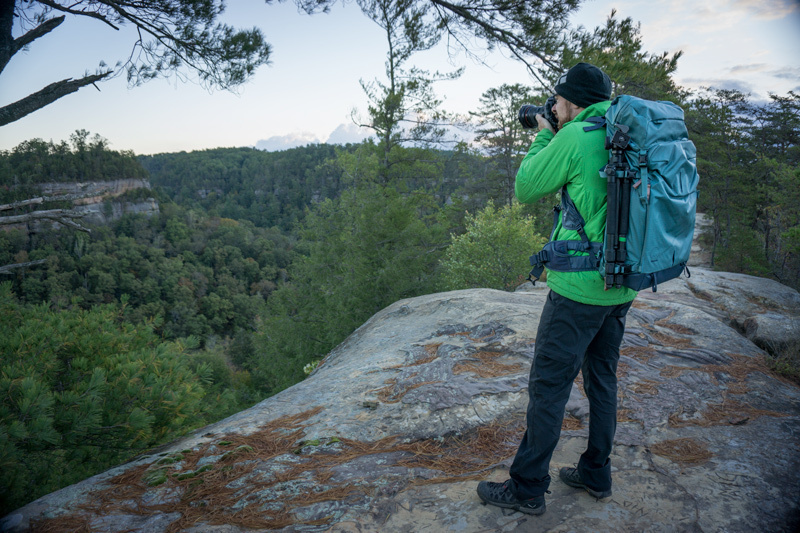 It’s a backpack that’s built for outdoor adventure photographers and filmmakers, and has options for 60L and 40L versions. Never heard of it? Well, I’m sure you have used or seen some of the gear that Shimoda’s lead designer has previously worked on. I’ll tell you about this and more in my full review. So first of all, let me provide some back story. 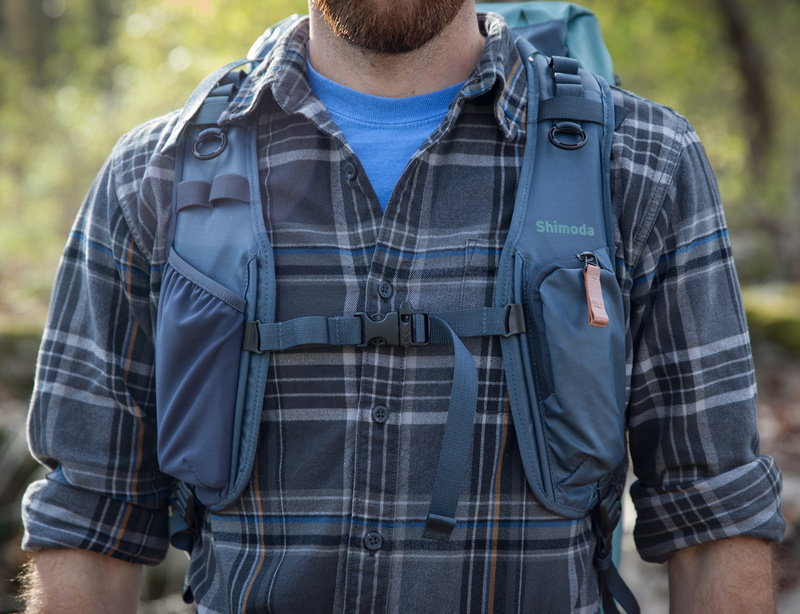 Shimoda Designs is using Kickstarter to launch their first run of packs. While that company might be new, the lead designer behind Shimoda, Ian Millar, isn’t new to the industry at all. Perhaps you've heard of F-Stop Gear? I’ve owned no less than three of their camera backpacks, and Millar was their lead designer until he left in August of 2016. This new line of packs seems to share a lot of the same clever features and quality that some older F-Stop Gear packs had, so excuse me while I get all giddy like a kid who is about to dive into his Halloween candy. This pack is for someone who is planning to put in some miles while carrying camera gear, so landscape photographers, wildlife, adventure sport, or any sort of outdoor activity. 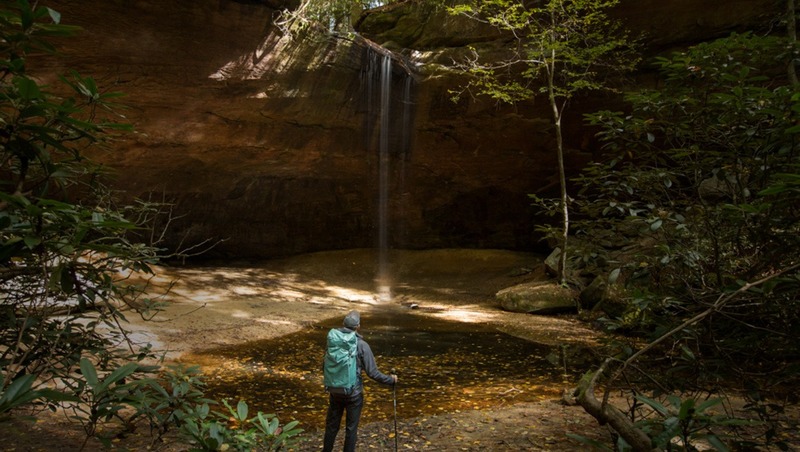 I’ve used a ton of camera backpacks made by companies like Lowepro and F-stop Gear, and to me the Shimoda Explore bests them in terms of structure and form for actual hiking. I’ll talk about it further on, but basically even when fully loaded, the Explore keeps its form and holds weight very well, which makes for a balanced pack that is a pleasure to hike in. Conversely, this pack isn't for the person who needs a way to transport gear from their office to the car to an indoor shoot location. The Shimoda Explore is built for being outdoors, on a trail, and its features reflect that. But those same features would simply be out of place when on a shoot that doesn’t require them. Tablet or 13-inch laptop pocket. Can carry a water bladder. A padded carry handles on the side. Can carry beyond 60 liters using fabric loops and extra buckle straps. Side and front straps allow for securing tripods, stands, or other equipment. Compression molding for comfortable wearing. Both rear and side access to main compartment. 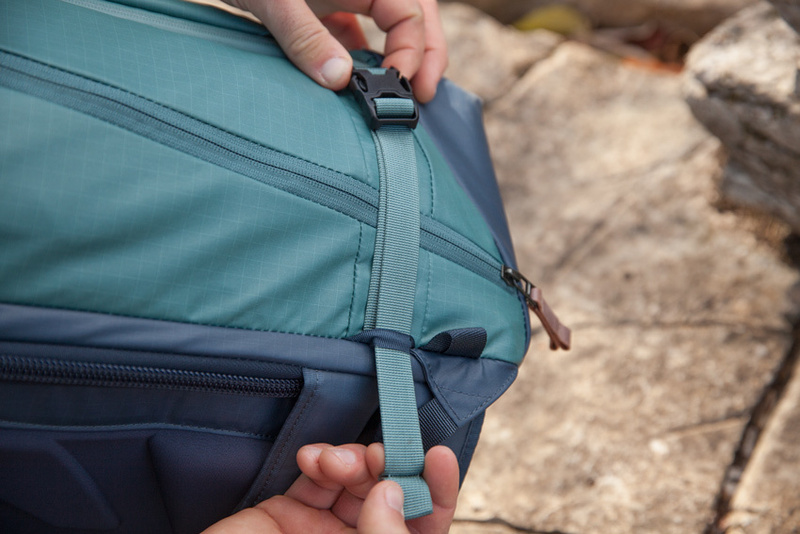 Shoulder straps and hip belt are loaded with stash pockets and loops. Whether I’m loading up at home or dropping my pack for any number of reasons, it’s really convenient that the pack can stand up straight on its own. No need to lean it on a tree or wall. This is something I don't think I needed until I had it; such a small feature but a really enjoyable one. The main access point is from the rear, or back side, that touches the users back when being worn. It swings open like a door when unzipped, and allows for getting at your gear easily, which will be organized in something called a Core Unit. 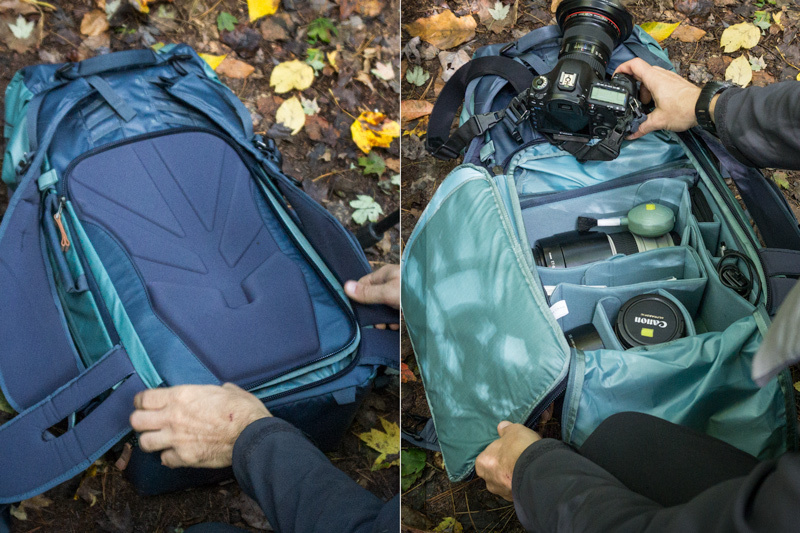 It allows for easy access while keeping your gear, and the back side of your pack, from getting dirty while you snap pictures. You can also get at the main compartment through a side access zipper, although it’s a bit of a squeeze. You might do this if you need fast access to your camera and don’t have the time to sit your pack down (maybe there’s some wildlife?). I personally don’t find myself using this feature much, but I love that I have the option to do so. 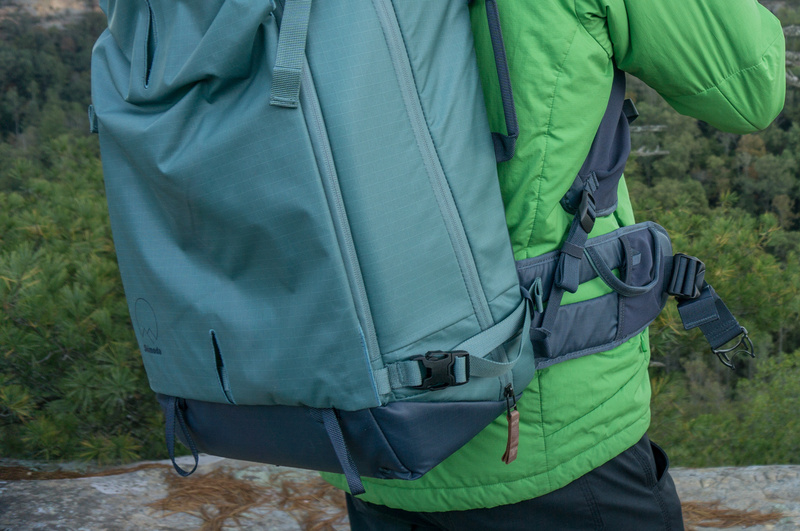 Finally, you can access and load your pack the traditional way: through the top. There is an internal, removable(!) pouch that sits above the core unit area. 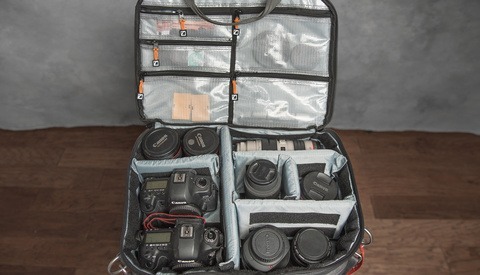 Want to keep your jacket, map, hat, and soft goods separated from your camera gear? Add the pouch. Want to add another core unit with a long lens? Unzip the pouch and stash it out of the way. This is another simple, helpful feature that makes this bag quite versatile. Let’s talk about the shoulder straps and hip belt for a minute. The small stretchy pockets and gear loops on the hip belt are great. There’s a super convenient cell phone pocket on the right shoulder strap, and a zippered pocket for snacks, keys, or other small essentials on the other side. I like to listen to podcasts and eat snacks while I hike, so this is perfect. 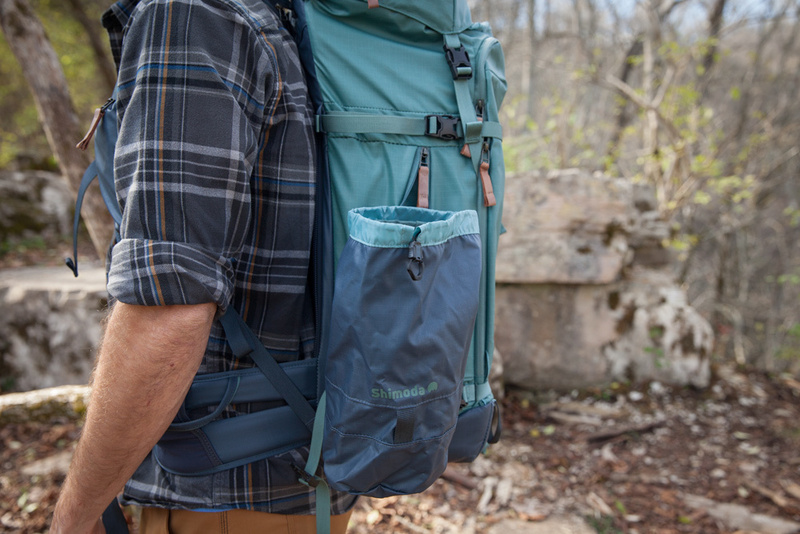 The Explore 60 has four different size options for looping the shoulder straps, which really helps this to become a one-size-fits-all pack. The hip belt is adjustable like your typical waist buckle. I'm a 32-inch waist and had it cinched within a few inches of its maximum, so if you're under a 30-inch waist you might have to really tighten it down. These are similar to ICUs or other customizable bag inserts. They are lightweight while being stiff, and of course modular. You can make them fit whatever kit you want to take out, and maximize the interior space of your pack. A medium size core unit will easily fit a full frame body, several lenses, filters, batteries, and a few other small items. A standard telephoto lens fits well above in a small core unit. I do hope in the future they release a large core unit where users can have larger telephoto lenses equipped and accessible. A side item that comes with some of the Shimoda bag kits are these small accessory pouches. They are a vibrant baby blue and feature a transparent panel, internal elastic and mesh pockets, and an external buckle. These are great for separating certain parts of your kit; I used mine to keep all of my GoPro items together, but separate from my main DSLR body and lenses. They come in three different sizes and are just plain handy. Great for keeping batteries, chargers, computer cables, card readers, audio gear, or whatever else you might need to bring, organized separately from your main gear. These could be used in a number of ways, and I think I'll get a lot of use out of these alone. For water resistance, the Explore boasts YKK splashguard zippers, while the material of the pack itself is noted as a carbonate ether, resin-coated nylon. 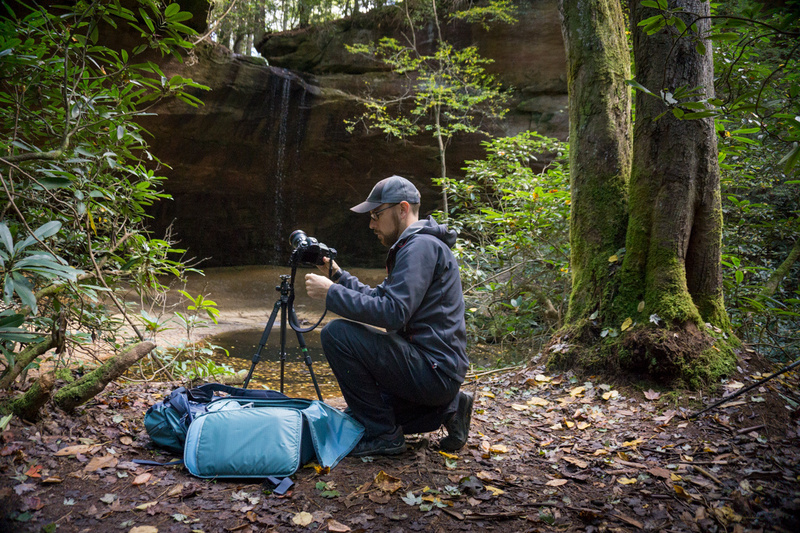 I don't know what that is because I'm a photographer and not a material engineer, but I do know that the inside of my pack stayed dry when I was doing some long exposures on a rainy day in the woods. Leather zipper pulls are like icing on the cake; I’ve personally broken four or five zipper pulls on other bags that are made of a cheap plastic or just a knot tied on a small cord, so these leather pulls are a like a luxurious, yet rugged touch of class. Padding and stitching are at a level you’d expect from a high-end camera pack. 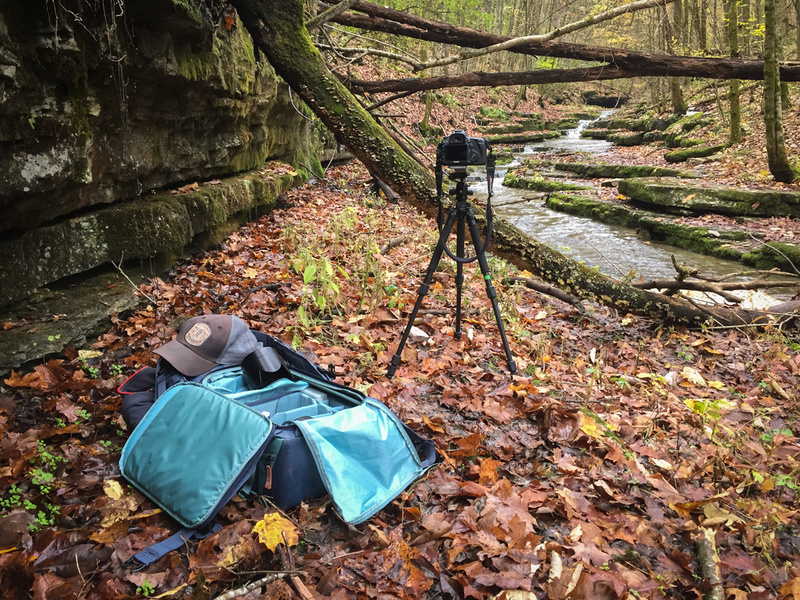 Versatility is also a word that keeps coming to mind, as the front panel has gear straps that at first are tucked away, but can be exposed when needing to do something like strap a tripod to the outside. Same goes for loops on the top and bottom that you can use to tie on even more gear. I’ve been using the pack for the last few weeks, and have put in at least 15 miles of hiking moderate to technical terrain with it. Getting started, I was able to easily adjust the pack to my size preference using the adjustable shoulder straps, and sorted out my core unit setup. On the outside of the pack, there are actually so many buckles and small features that it took me a few minutes to figure everything out. I sweat, I stopped to take pictures, I threw it down on the wet ground, and wore it while scrambling over rocks and river crossings. The Explore exceeded my expectations in terms of comfort and convenience in all instances. I weighed my pack for one particular outing and it was right around 30 pounds; the pack carried it well for the five miles I did that day. It really holds its form like no other pack I've worn before. It doesn't swing or sway about; it tightens to your upper body and becomes a part of it, moving with you rather than weighing you down. This is thanks in part to the internal aluminum frame, but also the user-adjustable fit. Lastly, most buckle straps have loops that will secure the excess slack. This means you won't have a bunch of dangling straps catching on trees when bushwhacking or squeezing through tight places. There are only a couple of things that didn't dill my pickle. If you like to use a bladder or smaller sized bottle for your water, then this should be of no concern to you, but if you like the larger bottles, you'll have to have it dangle off the side or stash it inside the pack. Personally, I would rather have seen that expandable pouch space used for an elastic-rimmed, stretch pocket, maybe even mesh. Something that I could use to quickly stuff a large water bottle, trash I find on the trail, a map, keys, or other quick stash/access items. Apart from carrying a big water bottle, the only other thing I didn't like was the color of the bag. The Explore comes in Seapine and Blue Nights, and I'm just not feeling either of them. 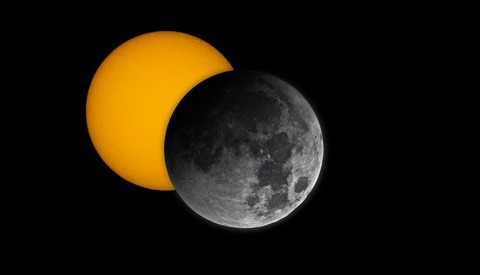 I dig straight black or vibrant colors like bright orange and lime green. This is of course totally subjective, and in no way affects performance. The Explore 60 with two small core units is available for $299 (Kickstarter pricing as of the writing of the article). Comparatively, a similar pack like the Lowepro Whistler BP 450 AW costs nearly $400, and while it may hold more in terms of photo gear, it has less capacity for other essentials and fewer overall features. A Tilopa from F-stop Gear is 50-liter, and of course has different features, but starts at $319 without any internal camera units. A single, medium ICU adds another $90. So with this in mind, the Explore looks to be a great value relative to other packs on the market. Again, this is Kickstarter pricing, so the final cost post-crowdfunding may vary. As with any crowdfunding campaign, donate at your own risk and understand the policies of that particular site. Extensive, versatile features for the outdoor shooter that were obviously well thought out. Back panel, door-style access to gear. The pack sits up straight when placed on the ground. User adjustable sizing for the shoulder straps. No good place for an accessible, large water bottle. Wish it came in different colors. 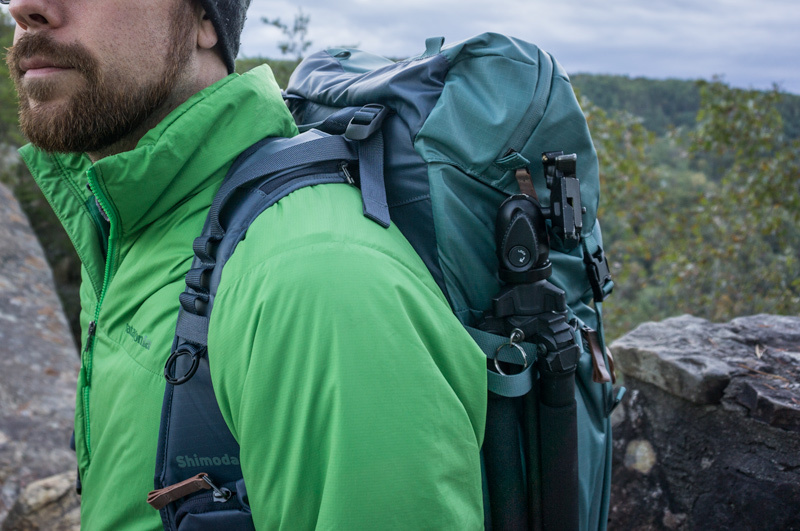 There’s a new player on the market for adventure camera backpacks. The Shimoda Designs Explore 60 is going make for some healthy competition in higher-end packs for outdoor photography. The Kickstarter has already been funded, so I’m excited to see what else comes from the Shimoda team in the future. If you’re in the market for a great camera-compatible backpack, the Explore 60 should get a close look. With a number of didn’t-know-you-needed-it-until-you-had-it features, I think users will be extremely excited to load up their camera kit and play in the woods or mountains with this pack. I saw one of these in action a couple weeks ago. Definitely seemed like one of the better adventure bags to come out in a while. I've had much, much simpler bags that surprise me with a feature I didn't know existed in the year or so in having it; this bag would probably be like Christmas every day.